Southern New Hampshire University has been on the leading edge of distance learning and bringing education to the students regardless of where they are. But they also understand the importance of building a local campus to strengthen the university’s unique core values. SNHU engaged Whiting-Turner Contracting Company with Mackey Mitchell Architects and Lavallee Brensinger Architects to fulfill their vision. The new 101,000 GSF, apartment-style residence hall houses 300 upperclassmen students and includes staff offices, a large multipurpose space and a “vertical main street” of communal, shared amenities to promote social interaction. As part of SNHU’s reimagining of campus, the design aesthetic is intended to bring a more contemporary look and feel to the university buildings. Monadnock Hall’s design draws from the local landscape, rich in woods and granite, and to integrate it within its setting while incorporating contemporary design elements to meet the desire of the university’s administration. Also, the university is very focused on inclusivity and accessibility for all students on campus. 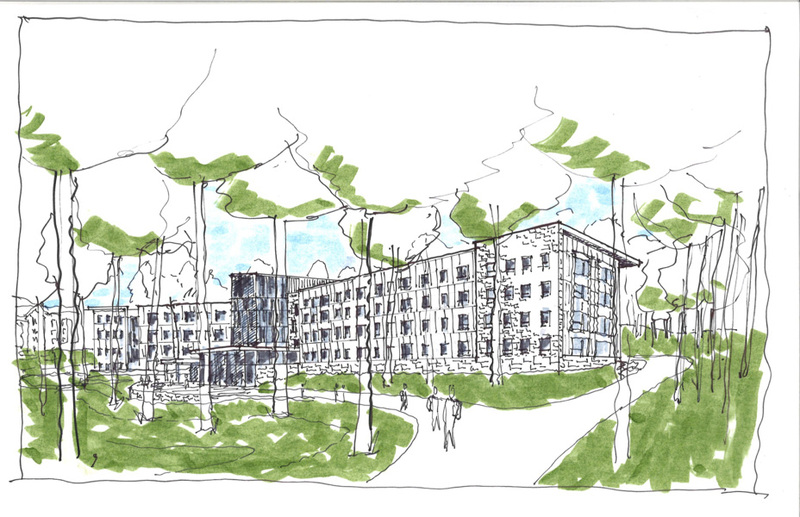 The design team oriented the building on the very hilly, wooded site to create minimal impact while still allowing universal access to and from the residence hall's main entrances. Patty Lynott, University College President, believes the beauty of the physical campus makes a difference not just for on-campus students, but can help online students feel as if they’re a part of something bigger. As part of the university’s push to include all students in the Southern New Hampshire University experience, the building contains several accessible rooms, including four ASD-focused rooms. These rooms are located at the ends of the halls and provide additional acoustical separation for those students who need those accommodations. By delivering these unique spaces, the university is encouraging a new population of students to join into the life of Southern New Hampshire University. This image shows a programming exercise that we conducted with students called "Design Temperature Taking." 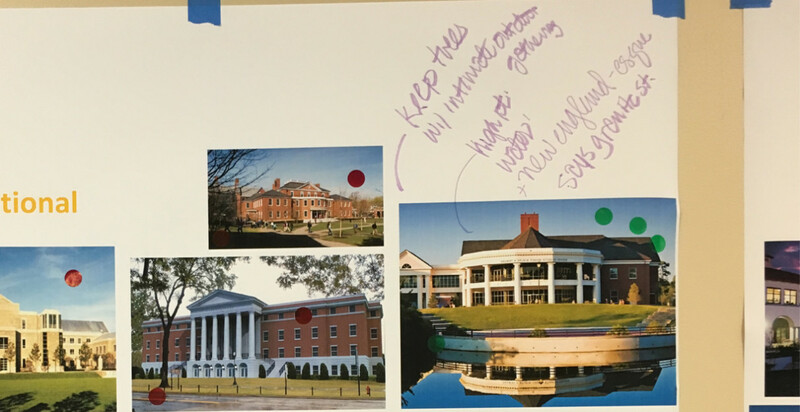 In this exercise, we get the students input on what images they like (green dots) and what images they do not (red dots). Early design sketch of the project. 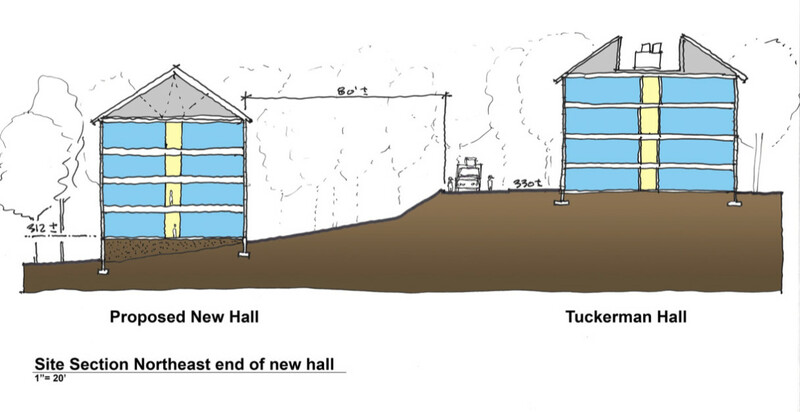 Scale study of the new residence hall with existing buildings adjacent to the site. Should the roof be flat or pitched? 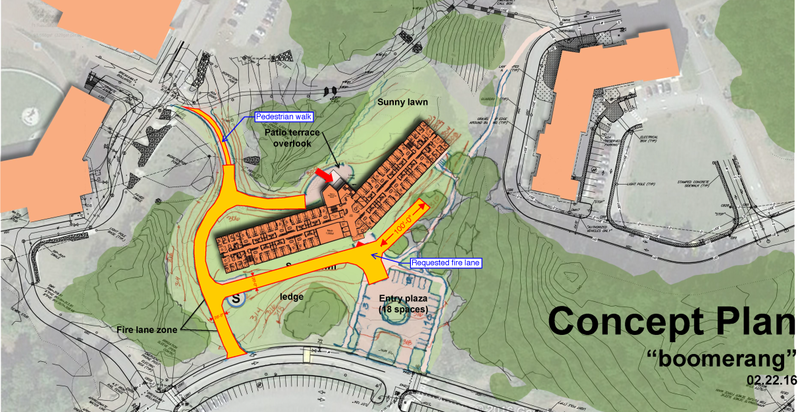 An early site study plan showing fire lanes and pedestrian paths. The real competitive advantage for Mackey Mitchell Architects is the people they employ. They are creative, engaging and strategic – there truly is no limit to their capabilities.